Detailed review of CeraVe Skin Renewing Cream Serum. 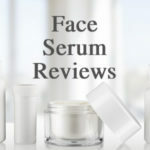 See what real experts and actual users have to say about this face serum. As a very popular skincare line, I was really excited to try CeraVe Skin Renewing Cream Serum. When I started trialing this product, my skin was extremely dry, chapped, and even painful in some areas. Thankfully, this cream serum was able to help repair my skin and leave it better off than before I used the serum. As a cream serum, CeraVe Skin Renewing Cream Serum is thicker than any other serum I’ve ever tried, but the consistency proved to be helpful for my skin. It hydrated my face and repaired my dry patches, and also helped clear away acne spots and congestion I was experiencing. Easy to incorporate into your skincare routine, and at a very affordable price point, this is definitely a serum to consider if you’re hoping to clear up your skin or increase overall hydration. However, if you’re looking to combat the signs of aging or increase skin radiance, you won’t find that in CeraVe Skin Renewing Cream Serum. As you can tell from the name of the serum, this is definitely a thicker consistency and texture than an average face serum. 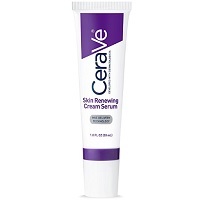 CeraVe Skin Renewing Cream Serum definitely feels more like a lotion or face moisturizer than a serum. It also applies like a face lotion, but it doesn’t feel overly thick on your skin. It’s really comfortable to wear. However, it does leave behind a bit of an oily residue on your skin, so my face looked pretty shiny once it had been absorbed into my skin. Before I dive into how easy it is to apply CeraVe Skin Renewing Cream Serum, I have to talk about how the product looks and the applicator. The serum itself in an off-yellow color and the applicator is a pump with a very small hole. When you go to expel the product, it makes a really gross noise and looks like a zip being popped. I know, I know—so gross! That’s why I had to warn you. As for the actual application, it’s really easy. You can choose whether to apply it once or twice a day, but I chose to use it both morning and night. Surprisingly, even though the serum left an oily residue behind on my face, it didn’t impact the look or wear of my makeup at all, so it was easy for me to use it twice daily! 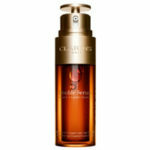 As I do with all other face serums, I cleansed and toned my face before applying the serum. It says to apply the serum in small dots where needed around your face, but I sort of feel like serum is needed everywhere on my face, so I applied it everywhere. I would also make sure not to use too much product. I used an entire pump and it took me forever to rub it into my skin, so you definitely don’t need a lot of product. I would say half a pump at most to cover your entire face, so be sure to push down slowly on the pump. Once it’s absorbed, you should follow up with your other skincare products. I personally found layering products on top to be super easy, which is a definite plus! Since CeraVe Skin Renewing Cream Serum is a super thick face serum, it takes a really long time to absorb and dry down. I would say it’s close to a minute before it feels like it’s mostly absorbed into your skin. 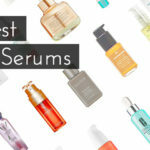 Normally I would complain about a long dry time because it adds time into my already long skincare routine, but I think it’s worth it for how well the serum works at hydrating your skin. CeraVe Skin Renewing Cream Serum is totally odorless. When I started using CeraVe Skin Renewing Cream Serum, I was having insanely dry, painful skin. All around my nose, mouth, and even eyes were red, chapped, and peeling. So the first thing I noticed when using CeraVe Skin Renewing Cream Serum was that it wasn’t painful to apply to those areas. When I woke up the next morning, I could already feel that my skin was more hydrated and less painful. 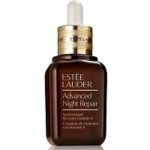 In fact, the redness and peeling around my eyes was almost completely gone, so I had a feeling right off the bat that I was going to like this serum. In some aspects, I’m super impressed with CeraVe Skin Renewing Cream Serum. I found that it was extremely hydrating and really did repair my skin. Within just a few days, the red, painful, peeling skin I was experiencing had completely been repaired. I also found that it cleared up all of my acne spots, and got rid of gross blackheads on my nose and chin. 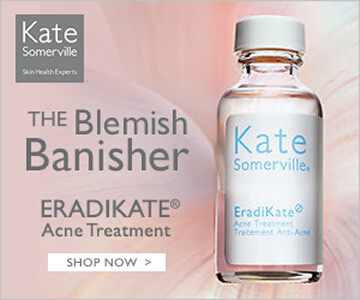 So as far as hydration and acne-controlling go, this face serum is a total hit. However, CeraVe advertises that it helps combat signs of aging such as fine lines and wrinkles, and helps restore radiant skin. Unfortunately, neither of that resulted from the serum for me. My skin looked totally the same in the anti-aging and radiance departments. CeraVe Skin Renewing Cream Serum is definitely worth the money! While I don’t think it makes an impact on anti-aging aspects of your skin or increasing skin radiance, it definitely helps combat acne and increase skin hydration. For the cheap price tag it has, I think it’s absolutely worth it for the results it delivers, and in a short amount of time, too! CeraVe products can be purchased on websites such as Amazon, or in stores such as Walgreens, so the return policy for their products is on a case-by-case basis depending on where you purchased the products. To purchase CeraVe Skin Renewing Cream Serum, click here. Texture/Feel Extremely thick face serum—feels more like a moisturizer than a serum. Leaves behind oily residue on face but comfortable to wear. Application Apply a thin layer of product on clean, dry skin twice daily. Apply other skincare products on top once serum absorbs into skin.